http://www.firesideboxers.com/ Robyyn @ Fireside Boxers home of Ginger's Sire Bernie! http://www.jinnybrux.com/ Wendy @ Jinnybrux Boxer's in the UK. The home of Brynn's UK lines !!! http://www.tanoakboxers.com/ Helga @ Tanoak Boxer's in Canada is the home of our Canadian lines! http://www.pedigreedatabase.com/boxer/dog.html?id=235551Hazenberg Boxer's Plato van de Hazenberg Tessa's great, great grand sire! http://www.pedigreedatabase.com/boxer/dog.html?id=827304 Shlingengrund Boxer's CH. Quinto vom Schlingengrund Tessa's great grand sire! grow much larger with shorter nose and deeper chest. The coat color of a boxer dog is determined by the genes it inherits from its parents. A puppy inherits one gene for coat color from each parent. The gene for brindle coat color (B) is dominant to that for fawn color (b), with the result that if a puppy inherits a fawn gene from one parent and a brindle gene from the other parent, the puppy *must* be brindle. A fawn dog must therefore have two copies of the fawn color gene (because if it had one copy of the dominant brindle gene, the coat color would be brindle not fawn). Breeding two fawn boxers together can produce *only* fawn puppies (because neither fawn parent has a copy of the brindle gene to pass on to the offspring). A brindle boxer may either have two copies of the dominant brindle gene (BB), or one copy of brindle and one of fawn (Bb). A BB (dominant) brindle can produce only brindle offspring, irrespective of whether the dog it is bred with is fawn or brindle. A Bb (non-dominant) brindle can produce both brindle and fawn puppies if it is bred with another non-dominant brindle or with a fawn. See the following diagrams for a pictorial explanation of the average litter results of various breeding pairs. White markings are also the result of the genes inherited from a dog's parents, with one gene inherited from each parent. White markings on a boxer results from the absence of pigment cells. This applies equally to the white markings found on 'flashy' boxers and to those whose coats are completely or predominantly white. The gene responsible for a solid coat color is the dominant S gene, while the gene that reduces the numbers of pigment cells is the recessive (s) gene. There are several different forms (alleles) of the s gene, which bring about different distributions of white coat. It is the extreme form (sw) which results in the white coat color of the white boxer. A predominantly colored (either fawn or brindle) coat occurs when the dog has at least one copy of the dominant S gene. 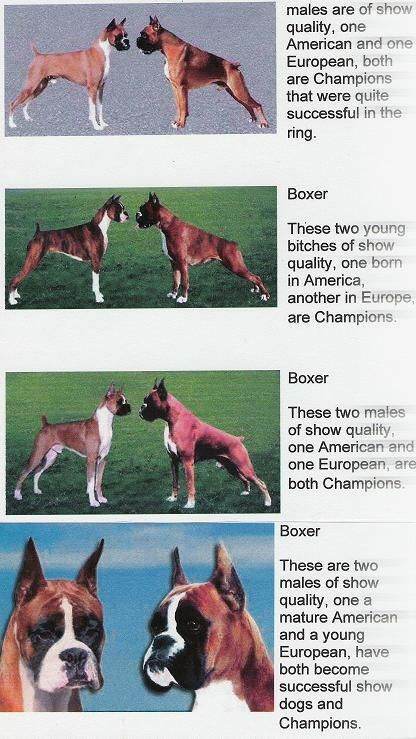 Flashy boxers (those with white markings on the face, legs, chest and belly) have one copy of the solid S gene, and one copy of the recessive sw gene. White and check boxers have two copies of the recessive sw gene. Note that plain, in this context, refers to genetics. Boxers without white markings are anything but plain (indeed, excessive white markings can detract from true boxer expression) and a better term to describe these dogs is "classic". White boxers should never be bred (even with Plain boxers) due to the intrinsic link between the white color and deafness. Degenerative Myelopathy, also known as chronic degenerative radiculomyelopathy, is an incurable, progressive disease of the canine spinal cord that is similar in many ways to amyotrophic lateral sclerosis. Onset is typically after the age of 7 years and it is seen most frequently in the German shepherd dog, Pembroke Welsh corgi, and boxer dog, though the disorder is strongly associated with a gene mutation in SOD1 that has been found in 43 breeds as of 2008, including the wire fox terrier, Chesapeake Bay retriever, Rhodesian ridgeback, and Cardigan Welsh corgi. Progressive weakness and incoordination of the rear limbs are often the first signs seen in affected dogs, with progression over time to complete paralysis. Myelin is an insulating sheath around neurons in the spinal cord. One proposed cause of degenerative myelopathy is that the immune system attacks this sheath, breaking it down. This results in a loss of communication between nerves in lower body of the animal and the brain. 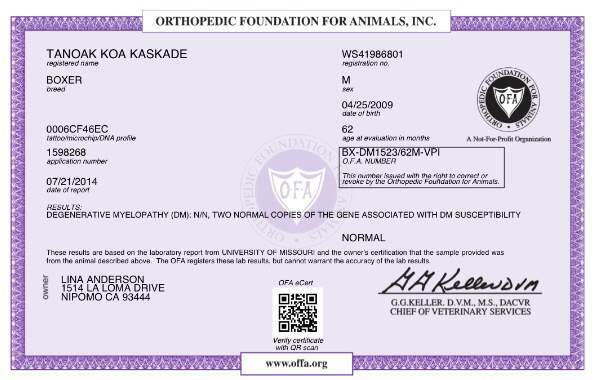 The Orthopedic Foundation for Animals has a DNA saliva test to screen for the mutated gene that has been seen in dogs with degenerative myelopathy. Now that a test is available the disease can be bred out of breeds with a high preponderance. The test is only recommended for predisposed breeds, but can be performed on DNA from any dog on samples collected through swabbing the inside of the animal's cheek with a sterile cotton swab or through venipuncture. The test determines whether the mutated copy of SOD1 is present in the DNA sample submitted. It must be interpreted with caution by a veterinary clinician in combination with the animal's clinical signs and other lab test results.